Bkerké (Agenzia Fides) - The teaching of catechism as an essential part of the mission of proclaiming the Gospel to which the Church is called, is the central theme of the 52nd ordinary session of the Assembly of Catholic Patriarchs and Bishops of Lebanon, which opened yesterday Monday, November 12, with the introductory speech of Maronite Patriarch Boutros Bechara Rai. 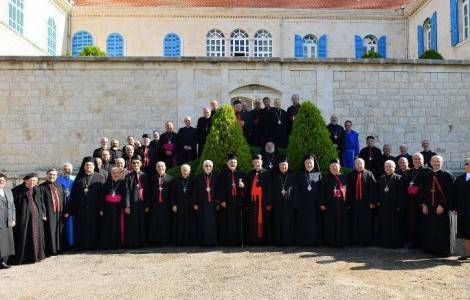 The assembly also represents an occasion for the Episcopates of the Catholic Churches present in Lebanon to outline once again the problems and critical issues that weigh on the daily life of the Christians in the Country and of all the other Lebanese. In his speech, the Primate of the Maronite Church described a social context marked by the "growing poverty of our people, because of the economic crisis and the suffocating conditions of life, and because of the great increase in unemployment, the high cost of living, of food, clothing". This scenario is exacerbated by the recurrence of sectarian forces that increasingly influence the choices of political forces and the functioning of national institutions, with state officials intent on safeguarding only their own private interests, without any intention of building a genuine rule of law. In such a context - added Patriarch Bechara Rai - the Churches must take charge of the "pastoral duty to defend the people, especially the poor and the oppressed", and must also offer their contribution to safeguard the constitutional, democratic and cultural principles that must regulate political action and set aside its sectarian deviations. "Today, if most of the armed militias no longer operate", the Patriarch remarked, "Lebanon is governed by the mentality of the "political militias", and we cannot accept this".